Hello Barbet lovers! | A Barbet is a Barbet is a Barbet.. Welcome ! My name is Elaine, I am Franco-American and I have Barbets: French Water Dogs ….in the French Bresse region, near Mâcon, an hour north of Lyon. All my Barbets live under my roof and they are my passion. After getting my second one in 2002 ( having had my first in 2000), I became extremely curious about the breed and why dogs looked so different, began to ask questions about this “rare” breed. At first , it was not easy to ask questions. Many were not interested in answering and sent me away with the “ask your breeder”…”well, I did!”said I. The information you will read about here will not be found in any book, anywhere but in archives about the Barbet breed we know, I have those archives. The breed club does not… Lots has been said about the “breed”, often heresay from second or third hand sources or off the net. 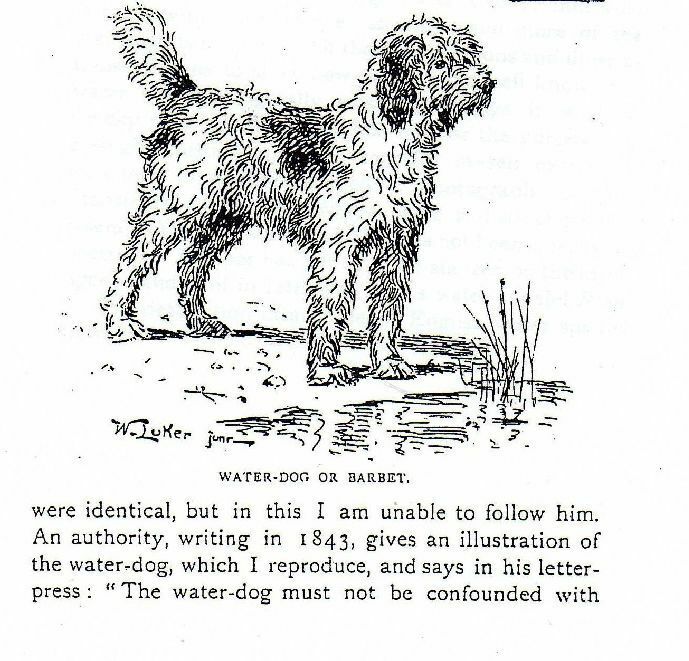 No real research had ever been done to show where this barbet/ rough coated water dog had come from and how it arrived in France. In the end, we may never know because its origins are the same as those of the Portuguese Water dog or the Spanish Water Dog IF it came up through Africa. Obviously, they stopped on the way up and mixed with locals. So, they mixed here and they mixed there and IF the came from the east along with the herding dogs way back then, it could also be a possibility since the Puli, the Komondor… Schafpudel also came from that direction stopped and became a country’s national pride and treasure. Mixes, there has to be, since the breed is so small ( 23 births in France in 2013), it could not survive from just inbreeding and there is a tremendous amount of documented Poodle ancestry in some lines. Some lines until 2000 had not a drop of the Barbet which was LOF in France, but not to the liking of JC Hermans who had decided that the Barbet was the biggest of all the waterdogs and did his best to reach his objective by eradicating the old breed, cancelling any confirmations made by SCC judges and making sure the old breed had not a chance, he modified the standard several times until it fit his breeding. There are now other breeds mixed in such as the Spanish Water Dog, the Portuguese water Dog and the Irish Water Spaniel. They are all different with different characters AND COATS despite everyone giving the generic description of the Barbet breed: ” they are hunters, great with children, hypo-allergenic”, which is not all true, and that they don’t shed hair and that IS true since they have a coat that grows continually and needs to be cut. Some cannot swim, much less retrieve and as for proving their dogs can work( hunt)? Some have had bad character and been put down.The only way to test hunting ability is official tests which prove a dog can flush, track, retrieve ducks, game and not just sticks. That, every dog CAN dog to please his owner. That also gives the breed a bad reputation since some people want a Barbet to hunt, buy one and the dog stands there, not knowing what to do! From what information I have, the Barbet given to us in the 70’s had no Poodle and it is rather easy to tell. Yes, it may have had other mixes( as all breeds do), one of which was a Portuguese Water Dog back in the 50’s, but to this day when comparing our heritage Barbet or “Vieux Barbet” it certainly is night and day from the one re-incarnated in the late 80’s early 90’s by the self proclaimed Father of the Barbet Moderne: Jean Claude Hermans. He of course, still has his fan club, mostly in Switzerland where he is honorary member of their club. The Poodle ‘s history is most interesting since it appears from documents, that its standard would have been elaborated in Germany and ad un tratto in the 30’s, became French…Of couse, seeing the times, communication methods and the political environment, I am not sure the Germans were able to fight for their Poodle. A Mrs Jeancourt-Galignani took it, ran with it and made it French…and voilà. The German Poodle clubs were furious, but nothing could be done. The Barbet “breed” emerged as a natural breed, untouched by and mixed with local populations but was never selected whereas the Poodle was selected into what it is today and has hardly changed. It looks like the Grand Barbet de Buffon ( Pudel) was a type of dog with a wooly coat and an undercoat used un many other breeds to obtain that undercoat to protect them in water. 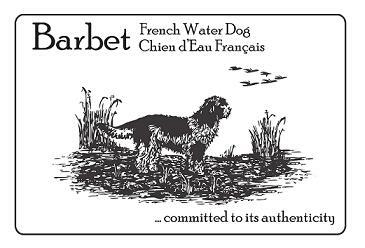 My objective here is to share facts about our Barbet: French National Treasure. The documents and photographs in my possession are quite rare, some have come from the original club created in 1980 and the second one, les Amis du Barbet… Often the information will be in French according to the source and sometimes in another language. It is first hand, factual information. My first site went online in 2006. It was in English because foreigners were looking for information about the breed and there was none in anything but French and not really much to be found on the net. So, my site was very popular. Many were thankful to have found some sources. I must admit that back then I did not know what I know now, which is quite logical, when you think about it! It certainly has been en enlightening experience of the dog world of which I had never been a part of before having Barbets. I had had white miniature Poodles, who had never participated in a dogshow, nor had I ever had a litter of pups…a lot of water under the bridge, since my first litter and even before. I hope the information I share with you will give you a better understanding of what the Barbet is and what it is all about. After extensive research in books, documents, letters, in France and other countries around France, I have come up with some most interesting conclusions abot the breed said to be in France, THE ancestor to the Poodle… and appears not to be! 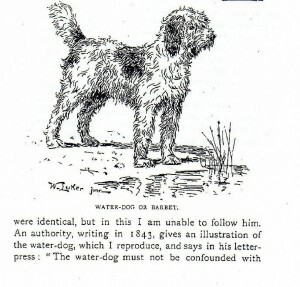 The other factual source is French Water Dog, who contains statistics, facts and archives with references about how the Barbet became a breed ( Barbet d’Arrêt/Griffon) after 1860 or so and is not by any stretch of the imagination, an ancient breed. It is a rustic, retriever/gundog/waterdog if you wish, but it has always been a farm dog, all around versatile dog who was a working dog, guardian, hunter, and companion.Its standard was written in 1886. If you want to learn about the generic barbet, a French generic word for any dog with a long coat and hair on the muzzle( barbe=beard) regardless of its size, I strongly suggest you read about the Poodle first. NB: All the information, documents and photos are copyright and may not be reproduced without written permission by the author. Throughout the years, we have tried to have matings that make sense and not just mate to mate. Not easy!